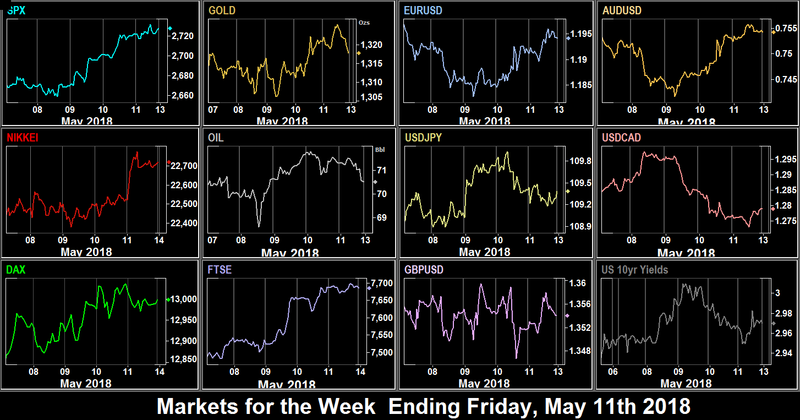 An even flatter day in US, Japanese and UK equities belied stirrings in Europe where the Italian MIB was down 2.4% at one point due to the failure of Italian coalition talks, and the possibility of another election. DAX managed a slight (0.1%) gain on the back of further Euro losses. 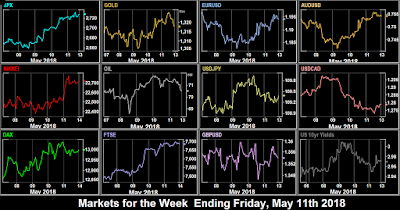 USD had another good day, advancing against all currencies except JPY, as President Trump confirmed the reimposition of Iran sanctions, and the yen benefited from its safe haven status. Gold was also flat, probably for a similar reason. Yields followed the dollar upwards, and EM currencies fell again. DIS beat on earnings and revenue after the bell and briefly spiked $2 before falling back. After the Iran decision, a rally in energy stocks pushed SPX up 1% today, and the energy-heavy FTSE 1.6%. DAX followed suit to an extent, up 0.31%, but energy importer Japan’s NKY only managed to end flat on the day. The dollar took a breather, with a flat DXY. This represented a flat EUR, gains on GBP, AUD and CAD, but a 70 pip move down for JPY as risk-on returned. Gold fell in line with JPY. Oil was further up in line with the energy rally ending 3% higher at $71.16. There was a 10-year Treasury bill auction today, and although the auction only made a maximum of 2.995%, trading did push through the 3% barrier to end at 3.01% on the day. Despite mixed Jobless Claims results, and a miss on the important US CPI print at 12:30, US markets still had a strong day, as SPX put on 20 handles (0.76%), and NDX did even better, up 0.92%, with AAPL making a new ATH. DAX, FTSE and NKY were up in line, despite their denominated currencies rising. The CPI print inevitably had an effect on the dollar, and DXY was down 0.39%, and most currencies and Gold were up. The exceptions were the two rate decisions, both holds. NZD dropped 77 points (1.11%) after the RBNZ decision, and GBP gave up 84 points (0.63%) after no change at the BoE. Although both currencies recovered somewhat, they still posted red candles for the day. Yields fell in line with USD, and ended back under 3%. Oil had a fairly quiet day, but held onto earlier gains in the week, and closed 0.4% up at $71.41. BKNG fell over 6%. Although the Q1 EPS was a beat, the forward guidance disappointed. The upward movement of the dollar we have seen recently was stalled this week. DXY was virtually flat (actually down 0.02%) with some currencies advancing and some receding. The best forex trade would have been to sell NZDCAD which moved down by 1.28%. SPX was the best-performing index. The crypto-recovery of the last two weeks stalled, with substantial drops in Bitcoin and Ethereum, mainly on Thursday and Friday. An huge roster of ECB speeches today: Mersch (10:00), Lautenschläger (10:15 and 15:00), Praet (11:45 and 17:15) and Coeure (17:45), added to the two Fed speakers Mester (06:45) and Bullard (13:40). Trade is back in focus with NAFTA talks continuing and Chinese Vice-Premier Liu visiting Washington. The Indian inflation print is at 12:00. A busy economic calendar today, especially for EUR. The British employment figures (the nearest the UK comes to an NFP) is the first major release since the rate hold decision, and average earnings growth is the key figure. US Retail Sales are less exciting as they are a CPI proxy, and we had that report last week. Fed speakers are Kaplan (12:00), and Williams (18:00), but of more interest are the Fed nominees Clarida and Bowman’s testimony at 14:00, particularly the latter, as we don’t know where she sits on the hawk-dove scale yet. German and Eurozone inflation are rarely much outside estimates and in any event do not move the markets much—unless of course there are big upsets. ECB President Draghi speaks at 12:00, but only a welcome address. Couere (12:30) and Praet (14:30) follow later in the day. In the EM world, Brazil, Poland and Thailand all have central bank rate decisions. Finally, NDX veteran CSCO reports after the bell. The biggest economic event of the day comes in Asia, with Australia’s version of NFP. The estimate of 20k is mid-range. Today is the NAFTA negotiations deadline set by US Speaker Ryan., and Chinese tech star BABA and DJIA heavyweight WMT report before the bell. ECB Constancio speaks at 10:30 and 12:00, and BoE Haldane is on at 16:00. The only Fed speaker is dove Kashkari at 14:45. Markets are closed in Norway. Canadian CPI is important, and beat or miss (as appropriate) could cause a sharp move. USDCAD is known to do that, especially if correcting an earlier move caused by the NAFTA outcomes. Three Fed speakers today: Mester at 07:00, Kaplan and Brainard (the dove turned centrist) at 13:15.